President, Building the Next Generation of Academic Physicians Inc.
Dr. Sánchez has worked extensively to promote diversity and inclusion in the physician and academic medicine workforces. In 2014, he joined Rutgers New Jersey Medical School (RNJMS) and currently serves as Associate Dean for Diversity and Inclusion. 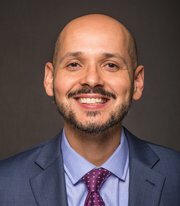 Since joining the RNJMS faculty in the fall of 2014, Dr. Sánchez has undertaken several new diversity-related projects. He has co-led the development of a longitudinal Community Engaged Service Learning elective, which is mandatory for all incoming students to facilitate their engagement in community service and reflection, developed a Safe Zone LGBT Allies Program to ensure the personal and professional development of LGBTQ trainees and faculty, and revamped the Men of Distinction Program focused on men of color. In addition to his academic responsibilities and clinical contributions as an emergency medicine at a Level 1 trauma center, Dr. Sánchez is on the Editorial Board of Academic Medicine and is an associate editor for the Journal of Health Equity; is the Co-Executive Director of the Latino Medical Student Association Inc., the largest Latino medical student association in the country with chapters at 129 medical schools; a member of the NIH Sexual and Gender Minority Research Working Group; prior Board member and current member of the Clinical Care Committee for Callen-Lorde Community Health Center, a federally qualified health center in New York City dedicated to providing quality care for LGBTQ patients; and the President and Founder of Building the Next Generation of Academic Physicians (BNGAP) Inc., an organization dedicated to building the upstream pipeline of diverse trainees (i.e., college and graduate students) considering academic careers. He has numerous publications and presentations related to LGBT Health and academic medicine career development for diverse medical students and residents. He received his medical degree from the Albert Einstein College of Medicine, completed his residency training at Jacobi/Montefiore, and is Board Certified in Emergency Medicine. He also holds a Masters of Public Health, with a concentration in the epidemiology of infectious diseases, from the Yale School of Public Health. He is of Puerto Rican ancestry, gay-identified, and was raised in the Bronx, NY.